Adam and I decide we should take a small trip when Faire season ends. We began these vacations years ago when we were houseparents as a way to get out of the cottage and off campus, away from work. Our trip in the fall, near the end of October, has traditionally been to celebrate our anniversary – hence the phrase “honeymoon adventure” was born. So, for our 2015 10th Anniversary Honeymoon Adventure, Adam suggests the Nature Inn at Bald Eagle State Park in Central PA, just north of State College – home of Penn State University. I sit at the small four top in our room this morning, after waking for the final time at 4:45 with Alistair who has a cold and isn’t sleeping well, drinking coffee from the Inn lobby and listening to Chet Baker play his cool trumpet directly into my ears, holding back tears. Such intimate sounds. Baby Sweeps unceremoniously falls back to sleep on the pullout bed, curled up next to his sister, while watching Arthur. Adam sleeps in the bedroom under puffy white blankets, the sun nearly ready to rise through the wall of windows. We fill our basic suite with our selves. The privilege to stay at an Inn to celebrate our anniversary, I can’t ignore that it’s a privilege. And I can’t ignore everything that allows us this privilege. So I’m thankful for all of those unstated things. I’m thankful for warm beds and cool jazz and hot coffee. I’m thankful for the amazing view over the water, with the colorful Bald Eagle Mountain as a backdrop to our time spent here. I’m thankful for rest and peaceful quiet. I’m thankful for the time I have alone with my self and with the universal spirit of God. I wish for a million mornings like this. Yesterday: We spend the morning doing some school work, because we thankfully have laptops and wifi and we can do our schoolwork from anywhere – both Stella and me. The Sweepster takes a mini-nap. We’re ready to go hiking when he gets up, so we bundle up and head outside. There are hiking trails mere feet from the front door. We set out on the Skyline Trail. Things are wonderful. Stella has a bit of an allergy thing going on, but overall she’s happy to go on an adventure. We’re having a grand ol’ time looking at the mountain over the lake and walking along this trail before we turn onto an intersecting trail that will take us into the woods. The woods are cool and quiet and I can’t help but feel connected to this earth. Sweeps keeps running off the trail and sometimes he lays down in the leaves and we’re all a little scared he’s going to get covered in deer ticks but we keep smiling and truck on. 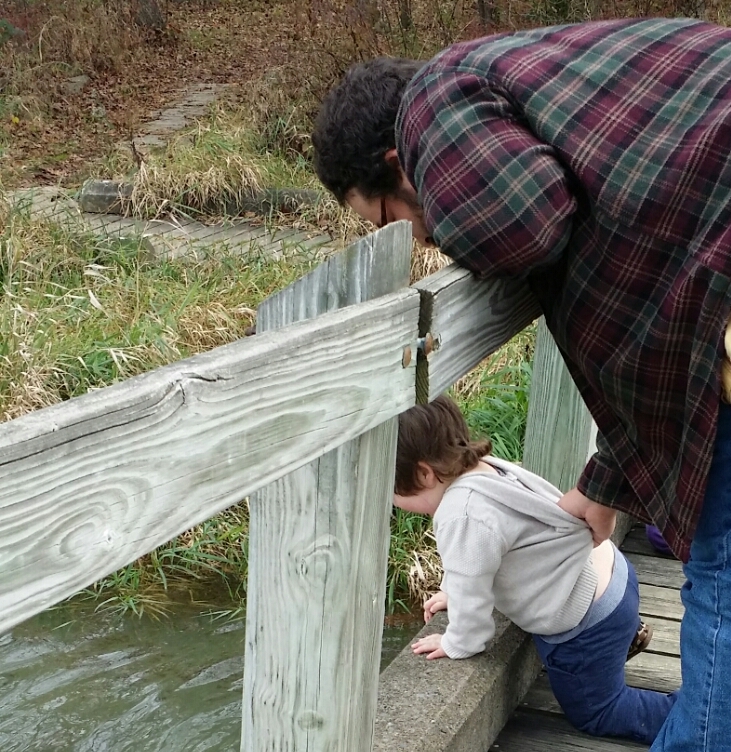 By the time we reach the foot bridge the toddler’s nose is running nonstop. Sweeps is hyped up. This baby doesn’t understand why he can’t go into the water. Things take an ugly turn. As we pull him away from the bridge for the return hike, he begins to cry. He refuses to walk. He insists on being carried while screaming in our ears. Mom and Dad run through the options of getting back to the Inn and the car the quickest, perhaps Mom can stay with the crying toddler while Dad and sister return to get the car and drive down to the loading dock to pick us up. Instead, we decide to fight through it and carry him. We take turns carrying him, all 45 pounds of sobbing wiggling angry sick toddler, UP the trail. There is nothing fun or romantic about this return trip, so I won’t even try to dress it up. It was awful. Adam did most of the carrying after I just couldn’t do it anymore. An extra 45 pounds of fussy toddler on my diaphragm was making it hard to breath and my arms were shaking. I was ready to give up and make house in the woods, ya’ll. I had thoughts of calling the Inn to see if they had a 4-wheeler they could drive down there to pick us up. When we finally reached the road to the Inn, it was like coming out of the woods in The Walking Dead. We might be closer to some sort of civilization, but we were still carrying a crying baby with green snot running out his nose, and the walkers might hear him and come after us. That last stretch felt like coming home after the war. I know, I know. I’ve not making light of actual combat war zones, but have you ever had to carry your sick miserable toddler over a mile uphill? Calm, it was not! Our trip here is sweet and beautiful and it wouldn’t be us if Alistair hadn’t pitched a fit yesterday in the woods. Adam and I ended our night sharing a nice bottle of wine with some European cheeses and chocolate covered raisins. It’s hard to complain, really. And this morning of solitude, allowed to do whatever I want with this time, is a treasure. This morning, with my coffee and jazz and sleeping babies and the beautiful sunrise brings me a deep calm. I take these moments whenever I can get them. This post is part of the #wholemama movement and this week’s theme of “calm.” Find the link up here and join us! What a wonderful time that must have been! And I love how you include this sentence, “Our trip here is sweet and beautiful and it wouldn’t be us if Alistair hadn’t pitched a fit yesterday in the woods,” because it is true in a away of all of us. We have to acknowledge the struggles along with the pleasantness to be fully who we are. Your writing really drew me in and I felt like I was right there with you. Blessings to you! Oh, I have been there with you – although my daughter doesn’t walk yet. But we have been those parents who had to grit their teeth and get back to civilization, screaming toddler or no. I feel you, mama! I take every quiet moment like the gift from God it is right now. You never know when you’ll have to put that mug of hot coffee down and next time you even remember it existed, it’s cold and stale. I try to tell myself it won’t be long before I’ll miss this. oh goodness. Yes. This is how I experience calm these days. It’s there. And then it’s not. Moments by other moments and we take them how they come. Each as it is. Thanks for this reminder of some truth about motherhood!